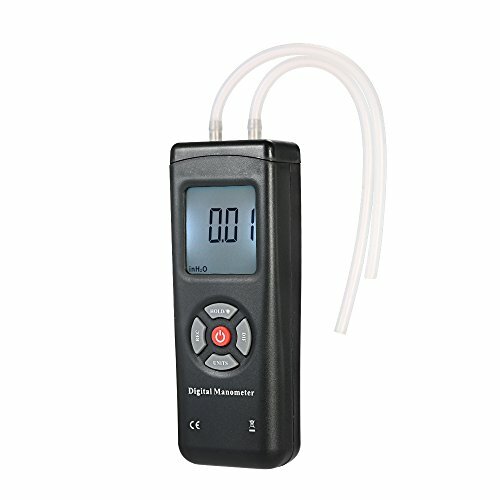 ❤❤The LCD Digital Dual-port Manometer is widely applied in measuring the differential pressure of areas and pipes, wind velocity of pipeline. Test the differential pressure of areas and pipes, wind velocity of pipeline. 11 selections of measuring unit: kPa, psi, kgfcm², ozin², bar, mbar, inHg, mmHg, inH₂O, ftH₂O, cmH₂O. Low battery indication, calibration and data hold function. Compact size and light weight, easy to operate and carry. Applied on chemical industry, electrical industry, nuclear industry to measure the difference of air pressure. ❤❤Test the differential pressure of areas and pipes, wind velocity of pipeline. ❤❤LCD display with backlight for easy reading. ❤❤11 selections of measuring unit: kPa, psi, kgfcm², ozin², bar, mbar, inHg, mmHg, inH₂O, ftH₂O, cmH₂O.